This web page provides an overview of LPR systems. The description starts 'technical' then proceeds to the 'market' view. In the above example: while the vehicle approaches the gate, the LPR unit automatically "reads" the license plate registration number, compares to a predefined list and opens the gate if there is a match. This technology is gaining popularity in security and traffic installations. The technology concept assumes that all vehicles already have the identity displayed (the plate!) so no additional transmitter or responder is required to be installed on the car. 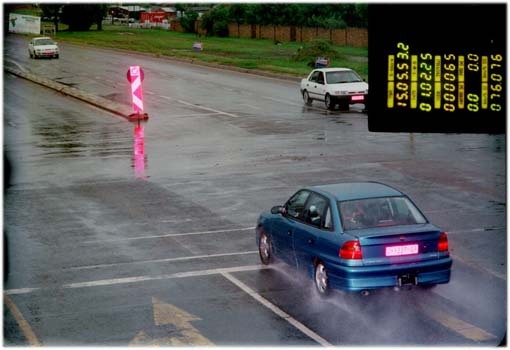 The system uses illumination (such as Infra-red) and a camera to take the image of the front or rear of the vehicle, then an image-processing software analyzes the images and extracts the plate information. This data is used for enforcement, data collection, and (as in the access-control system featured above) can be used to open a gate if the car is authorized or keep a time record on the entry or exit for automatic payment calculations. The LPR system significant advantage is that the system can keep an image record of the vehicle which is useful in order to fight crime and fraud ("an image is worth a thousand words"). An additional camera can focus on the driver face and save the image for security reasons. Additionally, this technology does not need any installation per car (such as in all the other technologies that require a transmitter added on each car or carried by the driver). LPR units are based on images of the front and/or rear plates. The following example shows a typical installation of an access-control system in the gate of a secured office compound. The car, with the plate number: W856RKX, is just exiting from the secured area and is picked up by the LPR system which identifies it as an authorized car and opens the gate. A welcome display (which includes the vehicle number and driver name) is displayed in the large outdoor display in the back of the car. 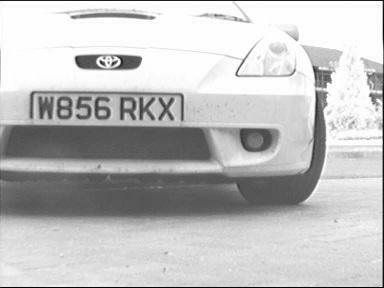 A typical image captured by the Infra-red illumination and camera unit is shown in the following image (this image is of the same car above). The image information is read by the LPR unit and is analyzed and recognized automatically. Note that the image is monochrome since the infra-red spectrum is above the normal color spectrum. Since the vehicle plates are based on different Country standards, they usually different in form, shape and material. Therefore the LPR systems are Country specific and are adapted to the Country where they are installed and used (in the above case - a UK installation). You can see a large collection of plates of different Countries - download some recognition demoes with the link at the bottom of this page. Some plates have additional information written or attached to the plate, such as state identification (as in USA plates in upper smaller row), province initials (such as in China upper row), plate issue date lable (such as in USA plates), vehicle type (such as in Korea in an upper row), Country flag (as in Europe on the left side), and more. For most applications this additional information is not required (and is usually not identified due to the complexity, variation, quality and resolution). The above image of the front side of the car, shown in a typical format, is composed of 256 grey levels ranging from black (grey level 0) to white (grey level 255). For a typical format there are 768 X 288 pixels (PICture ELements), or about 0.2 Million elements. This vast amount of information is processed by the recognition software in order to automatically locate and read the plate. The following image shows a zoom into the above image sample. The initial image starts from the raw data, then repeatedly zooms up (with factor x2) until the pixel level. The computer processing needs to work on the global information (the entire image) for detecting the plate, then zoom into the data in order to handle the small details and finally extract the registration data. The end result of the recognition process is a string (in the above case, "W859RKX"). This transformation of the image data into a result string is actually a very large compression of the original raw data (1:31600 !). However, recent improvements in the software and hardware have made the LPR systems much more reliable and wide spread. You can now find these systems in numerous installations and the number of systems are growing exponentially, efficiently automating more and more tasks in different market segments. 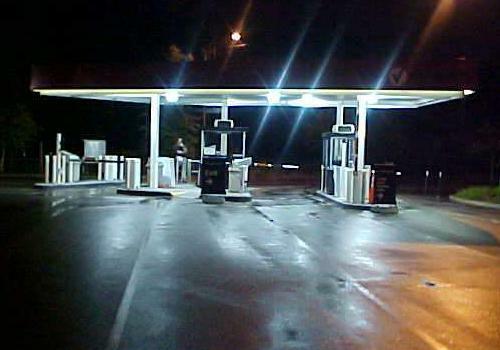 In many cases the LPR unit is added as retrofit in addition to existing solutions, such as a magnetic card reader or ticket dispenser/reader, in order to add more functionality to the existing facility. Even if the recognition is not absolute, the application that depends on the recognition results can compensate the errors and produce a virtually flawless system. For example, when comparing the recognition of the entry time of a car to the exit time in order to establish the parking time, the match (of entry verses exit) can allow some small degree of error without making a mistake. This intelligent integration can overcome some of the LPR flaws and yield dependable and fully automatic systems. Illumination - a controlled light that can bright up the plate, and allow day and night operation. In most cases the illumination is Infra-Red (IR) which is invisible to the driver. Computer - normally a PC running Windows or Linux. It runs the LPR application which controls the system, reads the images, analyzes and identifies the plate, and interfaces with other applications and systems. Software - the application and the recognition package. Usually the recognition package is supplied as a DLL (Dynamic Link Library). The following illustration shows a typical configuration of a LPR system (for example, for 2-lanes-in and 2-lanes-out access control system). The system ("SeeLane") is a typical example of such system. 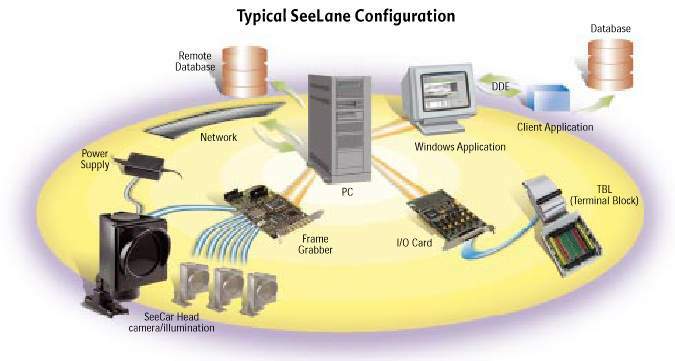 The SeeLane application runs as a background Windows application in the PC (shown in the center), and interfaces to a set of SeeCarHead camera/illumination units (one for each vehicle) which are interfaced by the frame grabber. The application controls the sensors and controls via an I/O card that is connected thru a terminal block to the inputs and outputs. The application displays the results and can also send them via serial communication and via DDE messages to other application(s). It writes the information to local database or to optional remote databases (via the network). You can point on the items and the bottom text area will display a description. For more information on this system, use the link below. (8) How does it Work? The following example shows how a typical access-control system works. It follows the order of the animation above. The vehicle approached the secured area, and starts the cycle by stepping over a magnetic loop detector (which is the most popular vehicle sensor). The loop detector senses the car and its presence is signaled to the LPR unit. 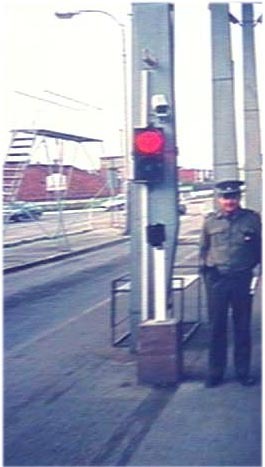 The LPR unit activates the illumination (invisible Infra-red in most cases) and takes pictures of the front or rear plates from the LPR camera (shown at the left side of the gate). The images of the vehicle include the plate and the pixel information is read by the LPR unit's image processing hardware (the frame grabber). The LPR unit analyzes the image with different image processing software algorithms, enhences the image, detects the plate position, extracts the plate string, and identifies the fonts using special artificial intelligence methods (such as Neural Networks). Most LPR units are based on an application running on PC under Windows. Other systems exist that do not require a PC (such as the stand-alone unit shown in this illustration). The LPR unit checks if the vehicle appears on a predefined list of authorized cars, and if found - it signals to open the gate by activating its relay. The unit can also switch on a green "go-ahead" light or red "stop" light. The unit can also display a Welcome! message with personalized data. The authorized vehicle enters into the secured area. After passing the gate its detector closes the gate. Now the system waits for the next vehicle to approach the secured area. Other types of applications use the information retrieved from the image for different purposes. For example, to prepare a speed or red-light violation ticket. All rely on automatic image understanding process performed by the LPR unit, which actually mimics the human mind. 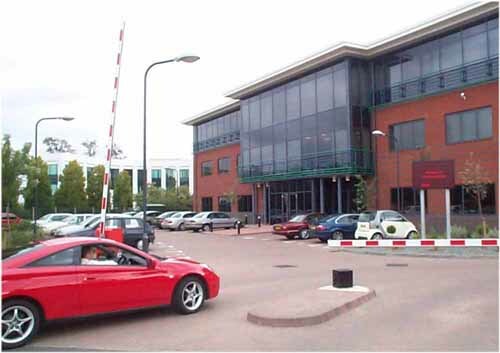 In this example, a car is entering a car park in a busy shopping center. The car plate is recognized and stored. When the car will later exit (through the gate on the right side) the car plate will be read again. The driver will be charged for the duration of the parking. The gate will automatically open after payment - or if the vehicle has a monthly permit. 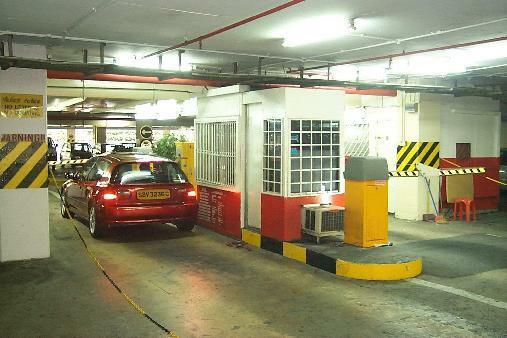 In this example, the gate has just been automatically raised for the authorized vehicle, after being recognized by the system. A large outdoor display greets the driver. The event (result, time and image) is logged in the database. 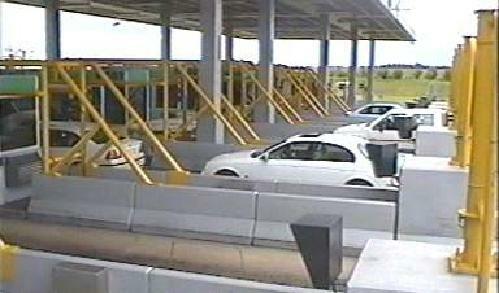 In this installation, the plate is read when the vehicle enters the toll lane and presents a pass card. 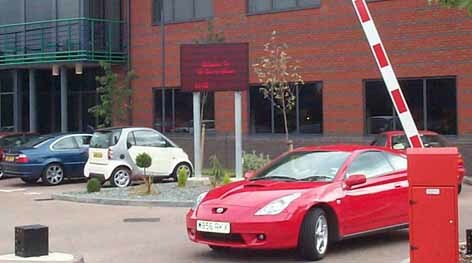 The information of the vehicle is retrieved from the database and compared against the pass information. In case of fraud the operator is notified. This installation covers the borders of the entire Country. Each vehicle is registered into a central database and linked to additional information such as the passport data. This is used to track all border crossings. 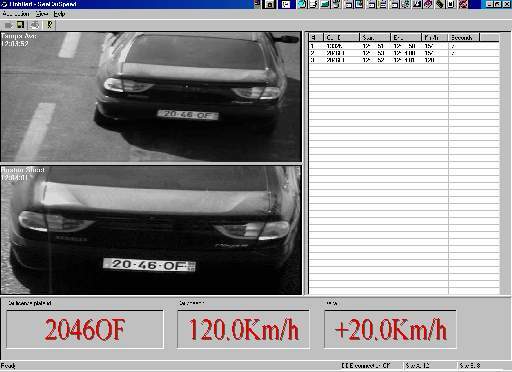 The photo is an example of a speeding car caught by the traffic camera. The rear vehicle plate is automatically extracted off the scanned film image, replacing a tedious manual operation and the need to develope and print the violation. The datablock on the top-right side is additional speeding information that is automatically extracted from the developed film and used to complete the fine notice and inserted to a database. The violators can pay the fine on-line and are presented with this photo as a proof with the speeding information. 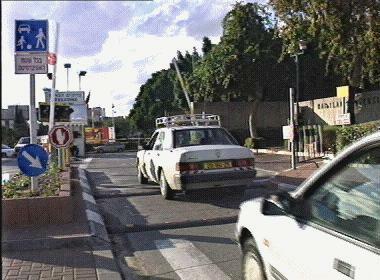 In this installation the LPR based system classifies the cars on a congested entrance to 3 types (authorized, known visitors, and unknown cars for inquiry) and guides them to the appropriate lane. This system reduced the long waiting lines and simplified the security officers work load. Marketing Tool - the car plates may be used to compile a list of frequent visitors for marketing purposes, or to build a traffic profile (such as the frequency of entry verses the hour or day). Travel - A number of LPR units are installed in different locations in city routes and the passing vehicle plate numbers are matched between the points. The average speed and travel time between these points can be calculated and presented in order to monitor municipal traffic loads. Additionally, the average speed may be used to issue a speeding ticket. In this example the car is recognized at two points, and the violation shows the photos of both locations which were taken on bridges on top of the highway. The average speed of the car is calculated from both points, and displayed if the speed passed a violation threshold, and optionally printed. Airport Parking - In order to reduce ticket fraud or mistakes, the LPR unit is used to capture the plate number and image of the cars. The information may be used to calculate the parking time or provide a proof of parking in case of a lost ticket - a typical problem in airport parking which have relatively long (and expensive) parking durations. This photo shows the gate of a long term airport parking. The car is recognzied on entry and the data is later used to track the real entry time in case of a lost ticket. You can see a typical installation for each application type in the web link below. Additionally, you can visit the product selection guide there that matches the market need to the solution, and also points to sample applications. For more information, visit the home site of one of the leading LPR Companies, Hi-Tech Solutions , and download more information and demos. The company offers its "SeeCar" product line which includes a wide range of LPR system configurations and accessories. Copyright Hi-Tech Solutions. Written by Yoram Hofman, R&D manager. This site has been visited times since 2/2/01.